I've really been craving Mexican lately and these tacos definitely curbed my craving! 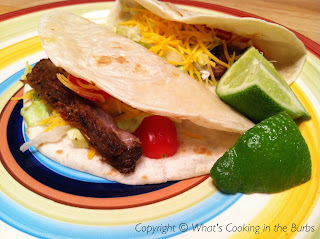 They were also a nice change from beef tacos and they were a hit with the hubby! I can't wait to make these again soon! Lay your steak in a baking dish. Drizzle with olive oil and lime juice. Evenly coat your steak with the pepper rub and then add your garlic. Cover and place in the fridge for at least 6 hours-overnight. (I marinated mine for 8 hours) Remove your steak and either broil or grill until desired doneness. (We like medium-rare) Assemble your tacos by placing some of the steak into your taco shell and topping with shredded cheese and lettuce along with any other additional toppings of your choice. Spritz with extra lime juice if desired. Enjoy! I love this! It looks super super yummy. We're suppose to have Mexican next week so I'll have to bookmark this recipe. Thanks for the yummy inspiration! Mmmmmm. . . I love Mexican. I will have to try these. Simple but tasty! Fabulous. Thanks for sharing. Bridgett, we love Carne Asada, your tacos look awesome! Hope you have a fabulous week and thank you so much for sharing with Full Plate Thursday.